The Rowan Tree Guest House is a traditional Victorian property, built with Lakeland slate. 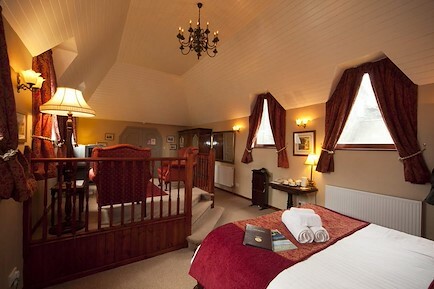 All four guest rooms have been recently refurbished to an excellent standard. All rooms are en-suite and include tea and coffee making facilities, TV and WI FI access. It is situated in an ideal Keswick town location, with free on street parking and just a 5 minute stroll to Keswick’s market square, lake, theatre and cinema. We are open through out the year and cater for groups, couples and families. We welcome walkers and cyclists and have a drying room for those rainy days. For our guests comfort we are completely non-smoking. We aim to offer a high quality service, with a friendly and relaxed atmosphere, enabling our guests to have an enjoyable stay, whilst exploring all that Keswick has to offer. Taking the A591 through Ambleside etc, drop down the hill and after seeing the Keswick town sign take the 2nd left turn into Manor Brow. Drop down the hill passing Castlerigg Manor on your right hand side. Keep going down the hill and round a hairpin bend. After the bend take the 2nd road on the right, Eskin Street. The Rowan Tree Guest House is located on the left hand side, just a short drive along Eskin Street. Take the A66 to Keswick (about 16 miles). Take the first turning off the A66 signpost A591 to Keswick & Windermere. At the junction turn right to Town Centre, this is the Penrith Road. Go past the Twa Dogs Inn, the Petrol Station and under the bridge, past the fire station and past the Millfield. The river Greta is on your right. Turn left down Greta Street and straight over is Eskin Street. The Rowan Tree Guest House is on the right - number 37. The nearest mainline train station is at Penrith connecting with bus service X4/X5. To check public transport information before you travel, visit www.traveline.org.uk or call 0871 200 22 33. Your enquiry will be sent directly to Rowan Tree Guest House. Please fill in as much detail as you can.